AMD Philippines recently took the opportunity during one of their events to tell us, or more like show us the brand new features and superior processing capabilities of their newest line of CPUs, graphics cards, and their new APU systems – short for Accelerated Processing Units. These new APUs are a combination of CPU, GPU, and other components built only into one chip to increase performance and decrease size, power consumption and cost – just one of the many new advantages we’ve been introduced to in their presentations. AMD has been in the market for a while, originally developing competing processors for the desktop market, among others. They’ve recently acquired graphics chip maker ATI, who’s best known for their well known Radeon graphics powerhouses. Together, they’re known collectively AMD, and they’ve combined those forces to build some impressive silicon for your desktops, laptops, and other devices. 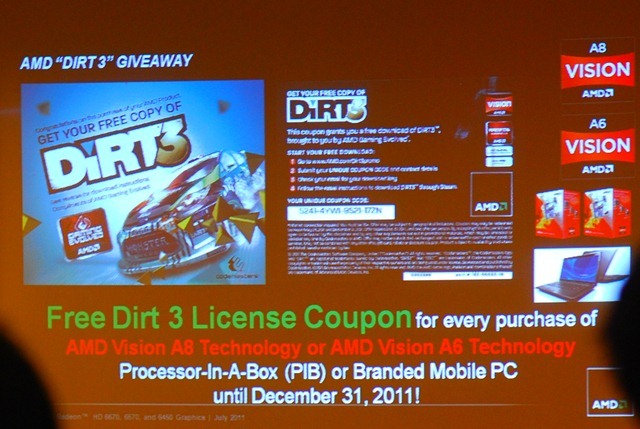 The main topic of this event’s presentation was the advantages of AMD chips over competing brands. 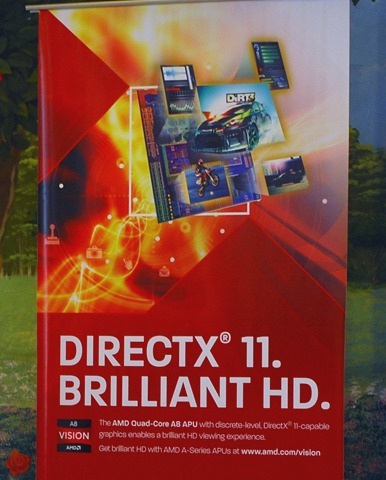 First off, AMD was the first manufacturer to have DirectX 11 graphics cards in the market – competitors have merely been doing some catching up. Intel’s integrated chipsets were mentioned to have no DirectX 11 support just yet – and that would be too bad, as they’ve said that developers are no longer making DX 10 games. Other advantages of the AMD systems include the possibility to use up to 3 monitors/screens on one graphics card on their mainstream GPUs with a feature called Eyefinity. Plus, the GPU can actually offload any processing from the CPU to help with general applications – speeding up even number crunching and other office related work. 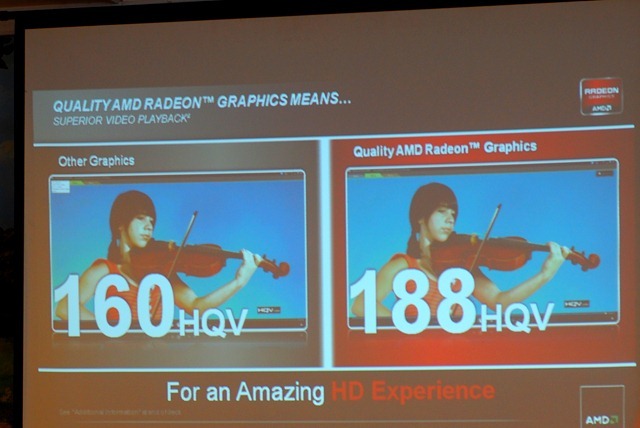 Then, we’re shown some impressive demos comparing the capabilities of their products versus competitors – with a general nod towards AMD’s performance, video quality, and most noticeably, power consumption. One feature that impressed us most was when the topic went towards AMD’s APU units. These are generally CPU’s with multiple chips built in – graphics and other components – to improve speeds between components. Even more impressive was when you pair an APU with one of AMD’s Radeon GPU cards. You can get up to 175% performance with these combined – as you essentially are running on the built-in GPU + the external GPU. In contrast, combining an APU with a graphics card from, say NVIDIA, will only yield 100% capability due to one GPU being disabled. All this, coupled with the monthly driver updates that they roll out for their products, should give some promising performance for all AMD system users. Since we’re due for an upgraded (or completely new) desktop soon, we’ll definitely check out AMD’s products next time we visit our local PC stores. We suggest you do the same! Check out a video we took playing Call of Duty: Black Ops and Crysis 2 on 1920×1080, highest/gamer settings below. For more pictures of the event, check out the gallery below.